A new menu was rolled out at Roseville’s Fantasy Flight Games Center in July, and I’ll admit that, as a regular, I was very excited. Lucky for me, restaurant and games center manager (and fellow Twin Cities Geek contributor) Kyle Dekker invited a few of us down to try the new dishes and give him our thoughts, as well as pick his brain in regards to what it’s like running the gaming center and gaming in general. Throwback Thursday columnist Garrick Dietze, business writer Matthew Seaton, and editor Katy Kelley joined me in taking the Kyle Dekker equivalent of the Pepsi Challenge and dug right in to the new offerings. While Matt, Katy, and I game at Fantasy Flight at least once a week, newbie Garrick was amazed at the depth of games available to play. But we were in it for more than just games—this was real-world MasterChef. 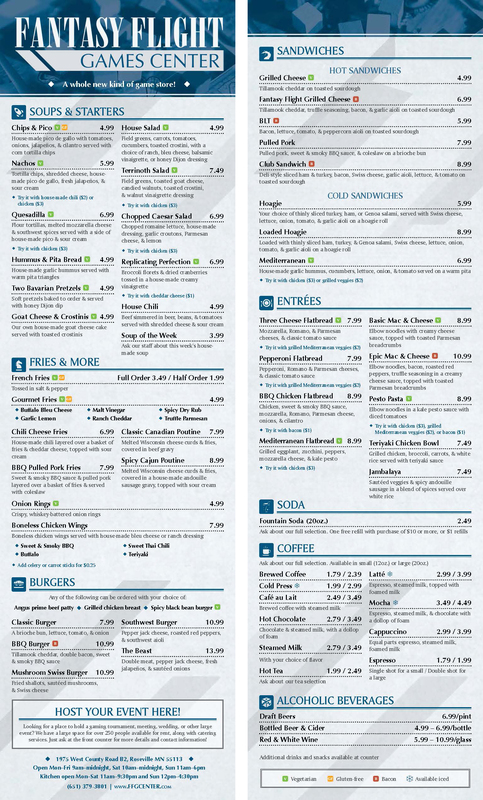 The new menu, rolled out in July 2016. We started off with the hummus and pita platter, the cheese quesadilla, the Bavarian pretzel with a honey Dijon mustard, and the Replicating Perfection Salad. 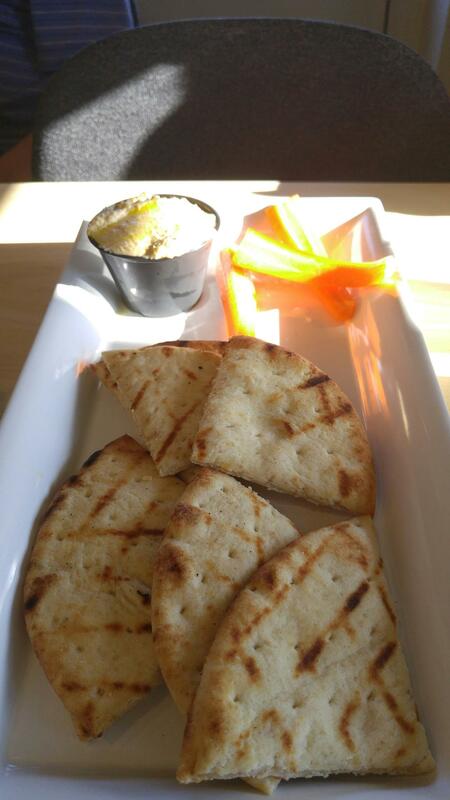 House-made hummus with pita bread and carrots. The hummus is made in-house—a secret recipe that was brought in. It has a great kick, well balanced with great garlic flavor. 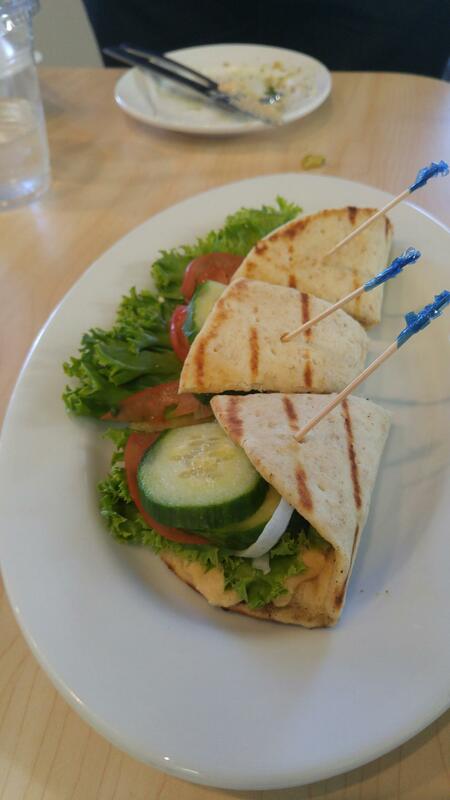 It comes with either warm pita bread or fresh cut veggies, all of which we tried. This was an instant table favorite, and both the pita and the dipping veggies were gone in a flash. This is also when we started talking to Kyle and asking questions. Twin Cities Geek: How long have you been the manager of the Fantasy Flight Game Center? Kyle Dekker: Nearly a year, since August 2015. TCG: Was it ever a dream of yours to manage or own a game store—or a restaurant? Kyle: Absolutely, so I’m essentially working a dream job right now. 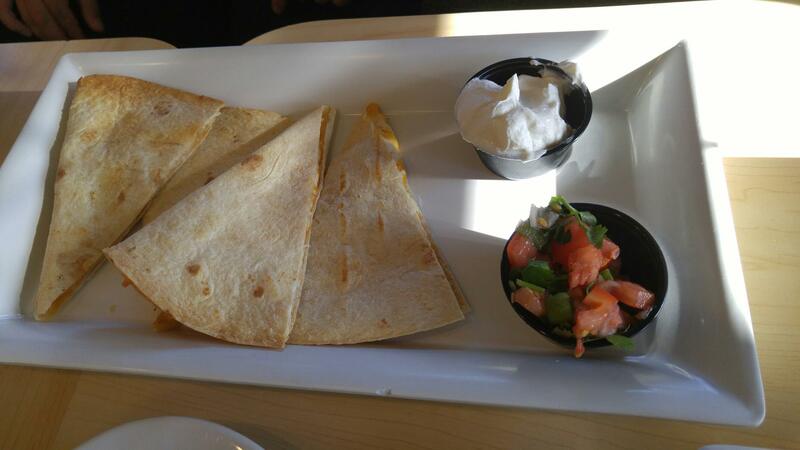 Cheese quesadilla with sour cream and pico de gallo. The cheese quesadillas were deliciously crispy, served piping hot with a side of fresh pico de gallo (with fresh jalapeños!) and sour cream. There is a nice light spice to the quesadilla on its own, but the salsa adds another layer of spice and freshness. TCG: What is your goal in running the Fantasy Flight Game Center? Kyle: With the help of my staff, I want to create an environment that welcomes everyone to come and play awesome hobby games. I want the experience of playing to be complete, so they can enjoy a great meal and grab a glass of wine or a beer while they play. One-stop entertainment and dinner of the highest order! 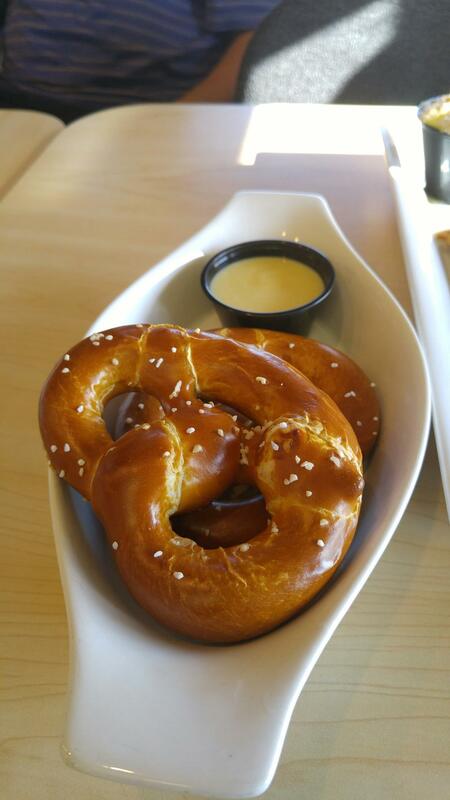 The Bavarian pretzels with honey Dijon dip. The Bavarian pretzels were delicious. They were warm and had the perfect mix of crispy outside and a soft inside, and the honey Dijon mustard was sweet and aromatic. TCG: Did you have specific directional ideas with the new menu ideas? Kyle: Yes. We wanted to expand the menu beyond typical pub-style food to add more items that were healthier—as well as providing a depth of options for vegetarians and people with food allergies. 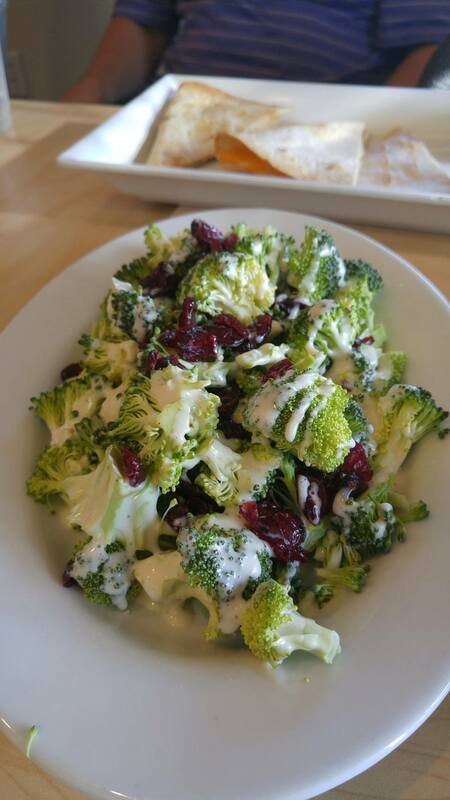 The last starter we tasted was the Replicating Perfection Salad, a delicious, crunchy broccoli salad lightly dressed with a sweet creamy dressing and delicious tart cranberries. It was nice and cool, but seemed like it would be a bit much for one—we agreed that it might be a good one to share with others. TCG: Replicating Perfection is a Netrunner reference—how do you come up with the names for your menu items? Kyle: Brainstorming with James, my head cook, and tossing names of dishes back and forth until we find one that sounds appealing and is appropriate for a game-store café. Next we had three new types of specialty fries: buffalo bleu cheese fries, barbecue pulled-pork fries with coleslaw, and Canadian-style poutine. Now, I was not really a fan of fries . . . until I started coming to Fantasy Flight. These crispy delights always come out nice, hot, and perfectly peppered and salted. Interesting fact! Fantasy Flight is very careful with their fries—the kitchen staff uses separate fryers to make sure they stay as vegan and gluten free as possible. The buffalo bleu cheese fries. 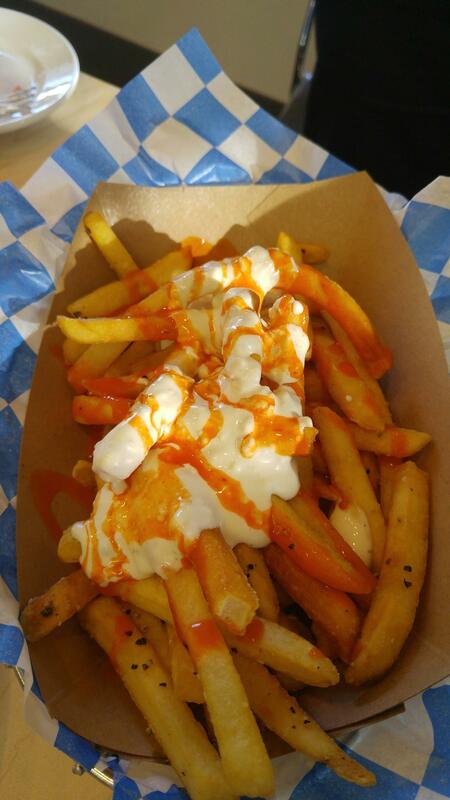 The buffalo bleu cheese fries are a great creative idea: a large basket of fries covered in buffalo sauce and house-made bleu-cheese dressing. Not only is this easy (though messy) to eat, but it is delicious. Putting together the spicy buffalo sauce with the cool, creamy bleu cheese and the crispy fries is a wonderful combination. I know I’ll be enjoying them again. TCG: How do you and your chef come up with new ideas for the restaurant? Kyle: We make things we think people will like, and then we run them as specials to see the response. Every new item on the menu existed as a special at one point or another. Not all specials make the cut. Barbecue pulled-pork fries with coleslaw. 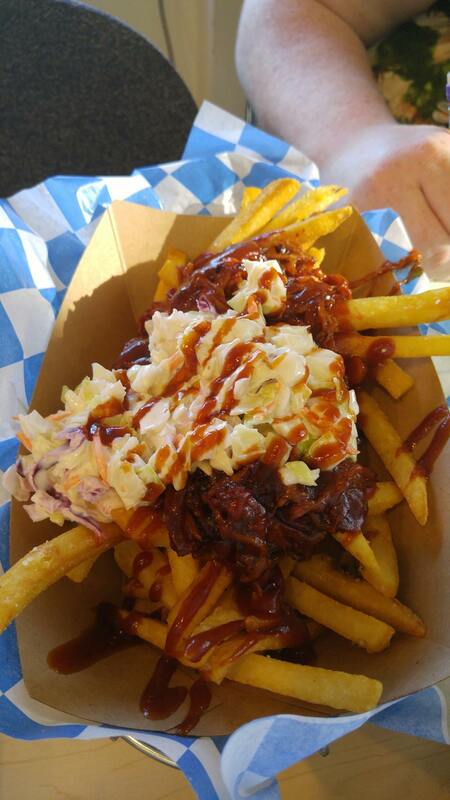 Speaking of creative ways to serve fries, the pork fries with coleslaw are another great idea: pulled pork slathered in barbecue sauce and topped with a light slaw. This did cause the first difference of opinion at the table, with Garrick stating the sauce was to sweet, while Matt and I thought it was pretty good, though heavy. The coleslaw on top really helps balance the dish. Major note—this order does require a fork! TCG: How often are you planning to freshen up the menu? Kyle: I’m planning on doing this at least once a year, and may even revisit it the winter to keep things fresh. Next up was the poutine! This classic from our neighbors up north is excellently executed. Poutine consists of a basket of fries with beef gravy and cheese curds. It may look odd and sound off, but this was good enough that I’m expecting Canadians to ask for Fantasy Flight’s recipe. 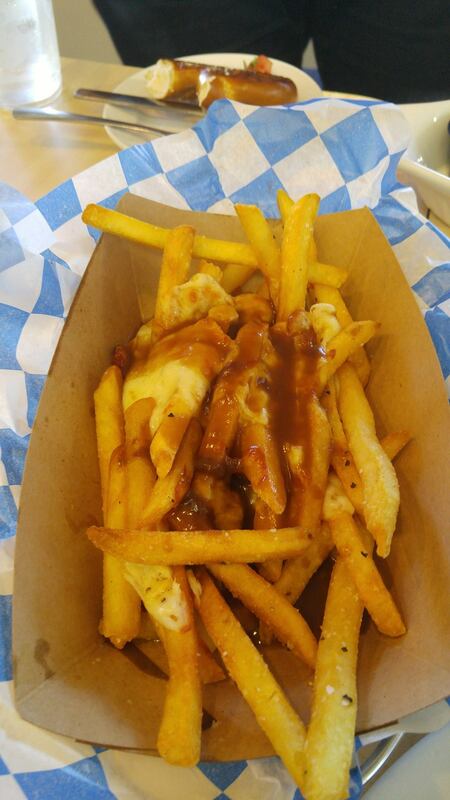 The smooth, well-balanced gravy covering the perfectly melted cheese curds and crispy fries were a table favorite. TCG: Do you have a favorite style of gaming? Kyle: I’m most fond of role-playing games and cooperative board and card games. Things are way more fun when you’re working with your friends. Now, on to the main courses. Our next round of food consisted of the Mediterranean sandwich, Mediterranean flatbread, kale pesto pasta, and the two new rice bowls, chicken teriyaki and jambalaya. 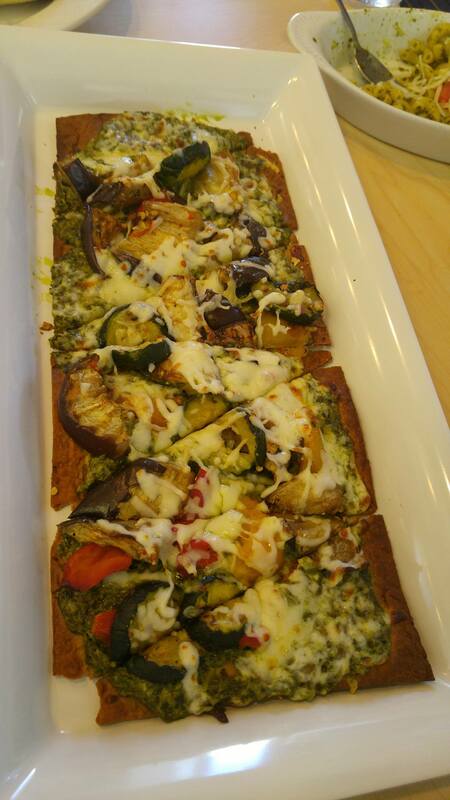 The Mediterranean flatbread is topped with kale pesto, cheese, and a mix of grilled Mediterranean veggies. While the flatbread was a bit too crispy for the table’s liking, the veggies were flavorful and very well cooked. TCG: What are your top five favorite games? Kyle: That’s a loaded question, as so many awesome games come out each year. Right now I would say—in no particular order—Star Wars X-Wing, Codenames, Eldritch Horror, Smallworld, and Dungeons and Dragons fifth edition. This will likely change in a week; there are too many awesome games to love just five! 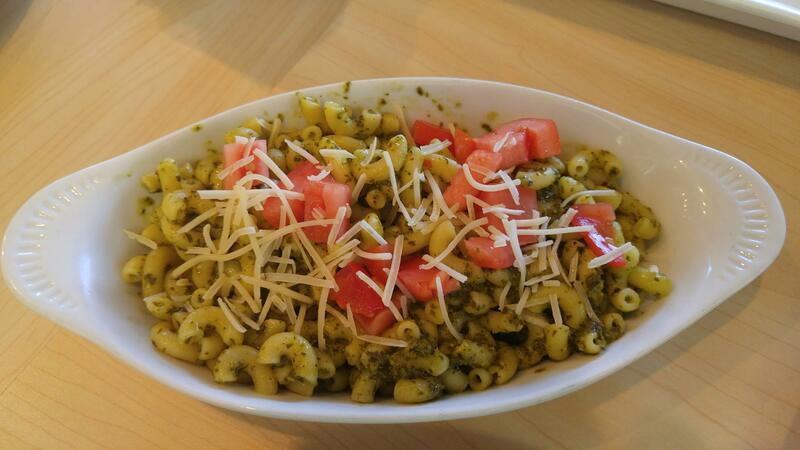 The Kale Pesto Pasta was probably our least favorite dish of the outing. While it still had a good balance and decent flavors, my fellow geeks and I agreed that a more standard basil pesto might be a better option. Still pretty good, though, and a great vegetarian for the mac and cheese—it can even be made vegan on request! TCG: Do you have a philosophy with your food? Kyle: Food should be made fresh with good ingredients by people who take pride in what they serve. 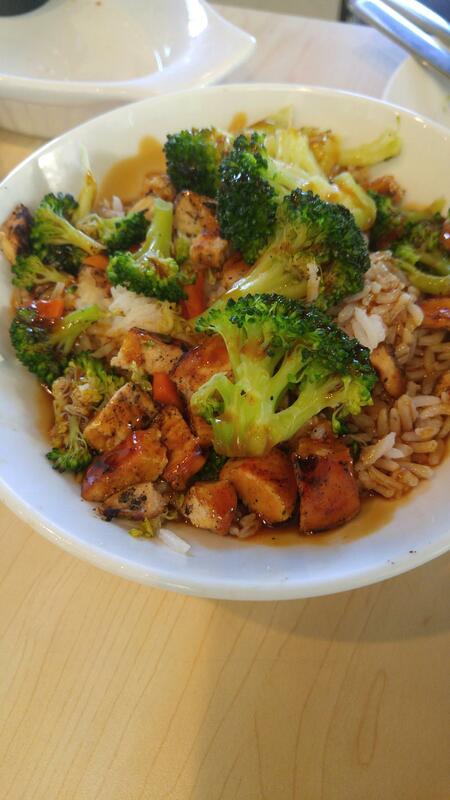 The teriyaki-chicken rice bowl was delicious, with moist chicken and well-cooked veggies mixed with a good teriyaki sauce and well-done rice. That said, the table agreed we would love to see more chicken and veggies in the bowl. TCG: What would you suggest for someone walking in to Fantasy Flight for the first time who has no idea what to order or what to play? Kyle: If they like meat, the pulled-pork french fries. If they are vegetarian, the Mediterranean sandwich with an order of our truffle-salt fries. For games, I would likely suggest they play Codenames or Timeline—both are easy-to-learn games that are fun to play in a group. Our last dish, the jambalaya rice bowl, was another table favorite. Starting with the trinity of celery, peppers, and onions, Fantasy Flight adds tomatoes, andouille sausage, and rice. The heat from the jambalaya was nice and slow, and not overly spicy. The bowl looked like it was overflowing, and it was definitely overflowing with flavor (especially the sausage). Garrick, who took home the leftover jambalaya, noted that it reheated wonderfully two days later and kept all of its flavor. All in all, good food and good company made for a good time at Fantasy Flight.